At the end of the 2012 presidential campaign, Tim Murphy of Mother Jones magazine undertook what became a monumental task: to count all the “game-changers” in the campaign identified by journalists and commentators. In total, he counted 68. Some of those moments were noted in jest, like Lindsay Lohan’s apparent endorsement of Mitt Romney. Some were more plausible, like the killing of Osama bin Laden. Regardless, 68 is a big number — enough for nearly three game-changers a week between May and Election Day. If you can’t quite recall three game-changers a week, don’t worry. There’s nothing wrong with your memory. 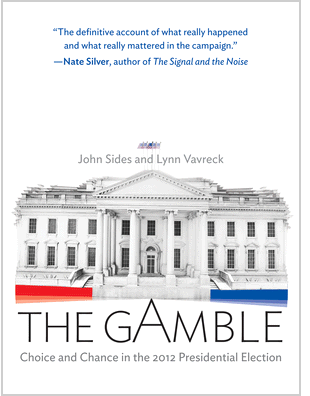 In our new book about the 2012 race, The Gamble, we show that almost all of the alleged game-changers were better described as “game-samers.” These events may have driven a few news cycles, but rarely did they move the polls. Why not? It’s not because persuadable voters were impossible to find. In fact, more of them exist than you’d think by watching the polls. Instead, the incessant search for game-changers came up empty because some commentators misunderstood the true nature of a presidential general election. They were treating it as a boxing match in which the knockout blow could come at any time. But in reality, presidential campaigns are a hard-fought tug-of-war — one in which the flag tied to the rope rarely moves very much. If you watched the horserace polls carefully, it would seem as though persuadable voters were nearly extinct. Between May and Election Day, the average of the polls calculated at HuffPost Pollster showed that the percent undecided dropped five points, and their votes appeared to be split relatively evenly between Romney and Obama. In reality, however, more than 5% of voters were moving. And we know this because our data in The Gamble are different. In partnership with YouGov, we began by interviewing 45,000 people in December 2011. Then YouGov re-interviewed 1,000 of those people every week from January until Election Day. And then most of these people were interviewed a third time after Election Day. These unusual data — a panel study, in social science jargon — allow us to show that underneath stable horserace polls were interesting undercurrents. For example, we can look at what voters told us in December 2011 and then after the election in November 2012. The vast majority of these voters — about 87% — preferred Obama, Romney or some other candidate in December and reported voting for the same candidate in November. That suggests a lot of stability — which isn’t surprising given that most voters are partisans and partisans are increasingly loyal in presidential elections. But that also leaves 13% who shifted — some from Obama to Romney or vice versa, and most of the rest from being undecided or preferring another candidate to preferring Obama or Romney. That’s a lot more movement than the 5% shift that averaging the horserace polls would suggest. How is it possible that 13% shifted their votes but the horserace polls moved so little? The answer is that these shifts — between the candidates, into and out of being undecided — usually didn’t advantage one or the other of the candidates. Why not? The answer lies in the tug-of-war metaphor. In presidential campaigns, both sides are pulling equally hard, which is why the flag in the middle of the rope appears to be standing still. If one side stops pulling, the other side would win quickly. But of course, no candidate simply shuts down his or her campaign. Instead, the effort of one side mainly serves to neutralize the other’s. Or when unexpected events give one side a temporary advantage, later events undo that advantage. Take candidate advertising as well. In The Gamble, we show that there were moments when Obama or Romney had an advantage on the airwaves — for Obama, during the early summer, and for Romney, in the closing weeks. Those advertising advantages did shift voters toward the candidate with more ads. But it was rare for either candidate to have an advantage that was both large and durable. When one side took the lead in the air war, the other side responded in kind. When each side had over a billion dollars to spend, a tug-of-war was inevitable. This isn’t to suggest that the campaigns were equal in every respect. The Obama field operation was clearly larger, for example (although our estimates suggest that it alone did not provide Obama’s winning margin). Nor does this suggest that the campaign had no important consequences. We show, for example, that the campaign rallied partisans of both stripes — helping to create the partisan loyalty characteristic of recent American elections. But this portrait of campaign effects is far more nuanced than facile narratives about game-changers would suggest. And it certainly improves upon the circular logic seen in some many post-mortems — whereby commentators suggest that the winner’s superior campaign caused him to win, but the only evidence for the superior campaign is that he won. People do change their minds during presidential campaigns. The challenge in a presidential election is that it is hard for either candidate to beat the underlying fundamentals and win a disproportionate share of those persuadable voters. Most days, the candidates fight to a draw. Stable polls might make it seem as though the presidential campaigns are ineffective. In our view, it’s more likely that they’re just equally effective. Presidential campaigns matter — both of them. John Sides and Lynn Vavreck are political scientists at George Washington University and UCLA, respectively. Their book, The Gamble, is available for sale here. You can also find their work at The Monkey Cage and Model Politics blogs.